If you look below the post content area, you will find the Portfolio Item Options metabox. Here you can set various options for the portfolio item. The first option Type determines what will happen when a user clicks on the item in your portfolio. 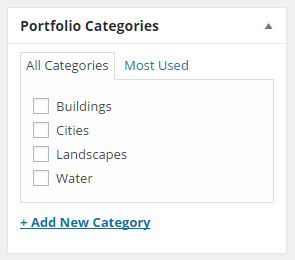 Now you should add a portfolio shortcode to the page content, above the content editor click the shortcodes button. Choose Portfolio from the drop down menu. Decide on the settings for your portfolio then click Insert & Close to insert the shortcode.